Skinny chocolate chip cookies made with absolutely no butter or oil sandwiched together with fat-free frozen yogurt and colored sprinkles. If this doesn’t say summer, I don’t know what does! Don’t you love happy mistakes? Last week someone tweeted me and told me they made my Best Low Fat Chocolate Chip Cookies Ever but accidentally left out the butter and they came out great. So naturally I had to see for myself, and I couldn’t believe it, they were great! For this recipe I also reduced the sugar a bit since I am adding sprinkles, they worked out great. Since then I’ve been obsessing on turning them into ice cream sandwiches. I mentioned the other day on my Very Berry Banana Fro-Yo Shake how much I love Stonyfield’s frozen vanilla yogurt so I put it to the test. Fourth of July will be here in no time so I made them red, white and blue. 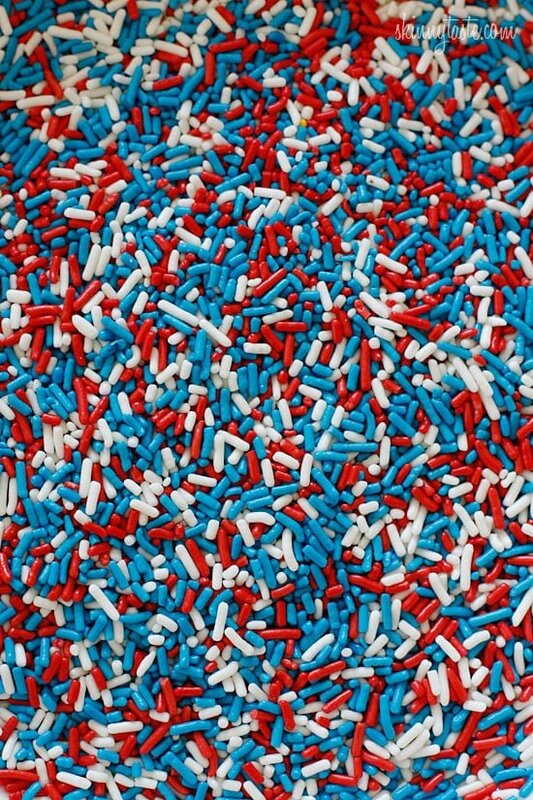 Colored sprinkles would be pretty too! These are a little messy, but fun to make with the kids. You don’t have to make the whole batch, you can make as little as one sandwich as needed or make them all. The only advice I have is make sure the frozen yogurt is really cold, and after you dip them into the sprinkles place them back in the freezer until they set. Keep them frozen until you are ready to eat, enjoy! (I highly recommend for best results) with cooking spray. 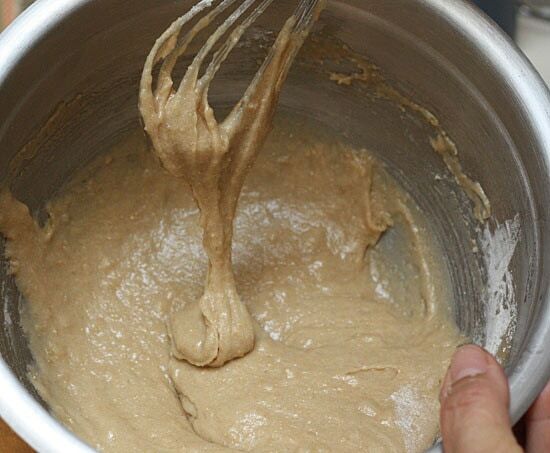 In another bowl, whisk the sugars, egg white, applesauce and vanilla together until light and fluffy. 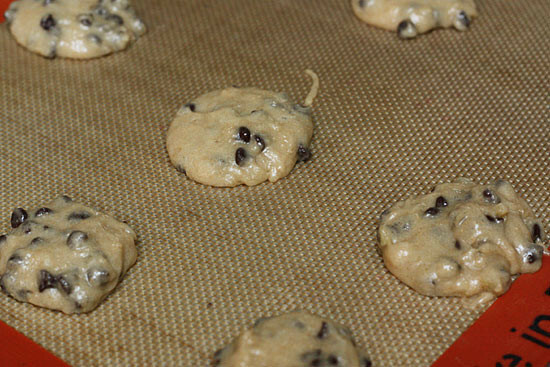 Drop by level spoonfuls about 1 inch apart onto baking sheets. Bake 8 – 10 minutes. When completely cooled, place 1 1/2 tablespoons frozen yogurt (I used a cookie scoop) in between 2 cookies and sandwich together. Roll the edges in colored sprinkles, place on a platter and return to the freezer until ready to eat. Oh my goodness! These were not only easy to make, they were beyond delicious! I made them with my daughter who is 9 years old. She loved rolling them in the sprinkles and we both loved eating them!! Thank you! Can't wait to try this recipe!! Yummy!! Thanks so much!! What an awesome idea! 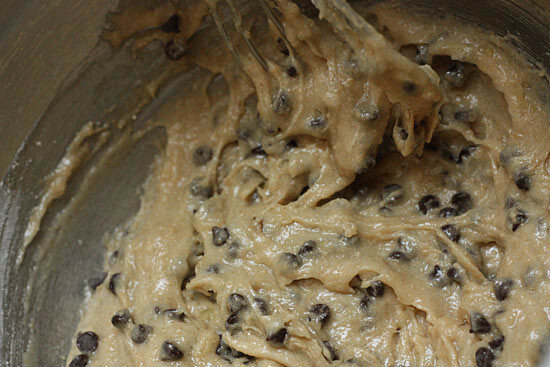 I've used applesauce in brownies, but never in cookies. I've got to give it a try. Where can you find the pastry flour? 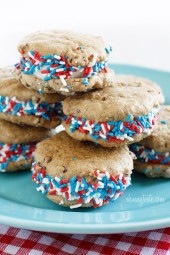 I want to make these for the 4th they look amazing!! It's usually near the all purpose flour. THANK YOU for these!!!! Gracious they are divine!!!! I made them last night and am making a second batch tonight. The perfect treat to have ready in the freezer. L O V E.
My cookies always turn out extremely cakey and chewy (not the good kind). They don't have the texture that is shown in your pictures. They're always super puffed up and not flatter like yours. I don't know what I'm doing wrong. The only thing different I'm doing is using all purpose flour and no pastry flour (could that be the reason)? Whenever I try adding applesauce to cookie recipes, I end up with this problem and I'm really confused as to why you were able to avoid this problem. Perhaps it was the flour?? I have been looking to make WW friendly cookies and I see that the old recipe has 5 points for 2 cookies. If the cookies are made with applesauce like the recipe above what is the point plus value? I think 4, guessing though! 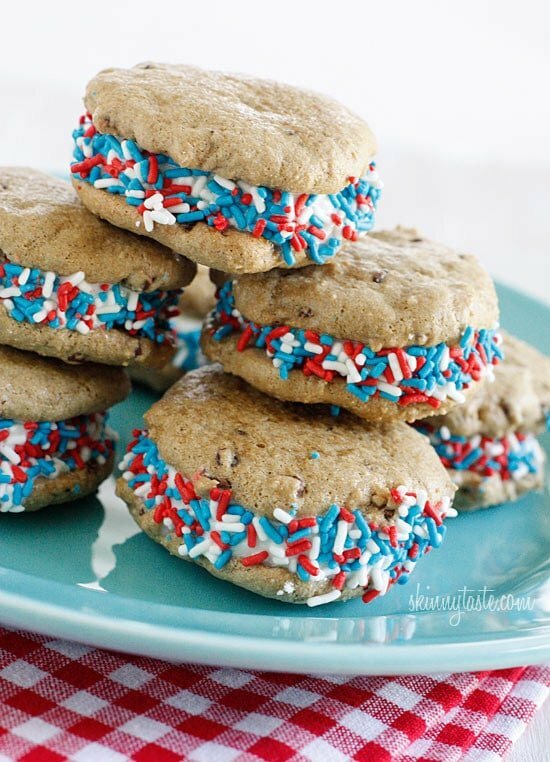 how many points is one of these ice cream sandwichs because if i read correctly it said 4 points for one cookie…. One time i made brownies and forgot to add the eggs! Surprisingly they tasted great! They were really chewy and good! I made the cookies, and they were tasty. I cut the sugar in half for my taste, and they were still good. I didn't have the frozen yogurt, so I put a cookie in a bowl, added sliced strawberries and drizzled with a little plain greek yogurt sweetened with about a 1/2 tsp of reduced sugar strawberry preserves and a dollop of whipped topping. It was delicious. Hi Gina, I just want to make the cookies themselves, does this make 24 cookies or 12? Gina, made these for tomorrow and of course we had to taste test them! YUMMY!! Couldn't find nonfat fro-yo in my area, so I got Fat Free ice cream. Still good. My husband told me I better go ahead and make another batch! I live in Denver so have problems pulling recipes from the internet since most don't come with instructions on baking at altitude…do you know how to tweak this recipe for altitude? Gina, just a heads up. When I put these into my tracker, they came out as five points. Think parchment paper would work instead of silicone mats? Parchment paper worked fine for me. I sprayed mine with Pam and they were perfect. I love your website! I have cooked and baked several things off of it and they have all been fantastic! I wrote a post about these cookies today on my webiste. Please feel free to check it out if you wish. Thanks for all the yummy recipes! Um no joke – I completely forgot the brown sugar and they STILL tasted awesome! Made a double batch and delivered them around! LOL realized later when I was putting them into my recipe builder on eTools that I messed up! Made fewer cookies, but less sugar=awesome! I linked to your blog today on my healthy choice challenge and gave my readers your link so they could use you as a source for healthy food recipes! I love your site and your recipes. These look amazing. I just found your site, am following you on Pinterest, and pinned your site too! I'm on WW and this is so helpful. I think there's something wrong with the sidebar (or maybe my computer? or user error? 😉 ) though, when I click on the points + tags, no recipes show? These were SO good! My sister and I had 2 each, but then my husband came in and ate the rest in 2 days. Good thing they weren't from Cold Stone 😉 But seriously, I thought they were fantastic! These cookies weren't to bad. They defiantly taste like a healthy cookie but for some odd reason, the next day, they tasted 100 x better. Sort of like a chewy "Mrs.Field's" type of cookie. I preferred these cookies without the ice cream because i found they were too sweet with it but overall, delicious recipe! I love ice cream sandwiches! Love the fact that these aren't loaded with fat! Yum! I just got the ice cream maker attachment for my mixer, so I think I'll try making my own frozen yogurt…I'll let you know how it goes!!! Made these with Elan Black Raspberry and Coffee Fro Yo! Delicious! Just wanted to say I followed the original cookie recipe to a T (used the 2 TBSP butter and Whole Foods sells bulk whole wheat pastry flour for $0.99 a pound) and it came out great. Chewy, crispy edges, did not fall flat or get cakey. I think it's imperative to really beat the wet ingredients (I used my Kitchen Aid with the whisk attachment) and thoroughly mix in the dry ingredients but not overbeat. My rule of thumb too is to make each recipe as is the first time, to get a feel for how it will work before I make subs like Splenda, etc. 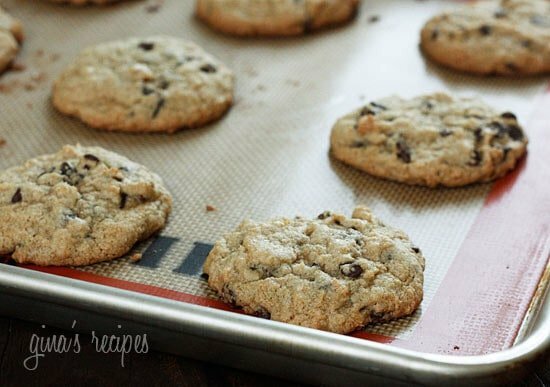 Also age and storage of your baking soda could lead to flatter cookies. Can't wait to make these into cookie sandwiches tonight for girls night! This is the second time I have made these cookies, and both times they ended up so flat. What am I doing wrong?? You might need to replace your baking soda. Sounds like it's expired. Yes, perhaps it's the baking soda. Or my original recipe uses less, I was actually trying to make them flat for the sandwich but they didn't come out flat like I wanted. Thanks! The baking soda says it doesn't expire until July, but I will get a new one and try it again with a little bit less. Don't get me wrong-I still thoroughly enjoyed the cookie sandwich! Ah, I must have bad baking soda too. These were so flat, that I couldn't get them off the cookie sheet in one piece. I agree they are still yummy bits of cookies. Will have to eat mine in a bowl tonight instead of as a sandwich! These look so awesome! 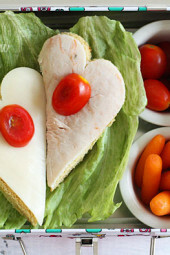 I am going to make then later this afternoon! I just joined WW and am looking for recipes that are yummy and already have the points calculated for me? For every recipe you add, do you put the points in? Just want to make sure that I am being accurate and sticking to my new lifestyle! Thank you so much of all of these great and tasty recipes, Making buffalo chicken lettuce wraps tonight! Hello Gina! I always read you blog and love the recipes. I really want to try this one, but I'm Brazilian and can't find apple sauce anywhere! What would be a good substitute? Thank you! They do sell it here, I just had no idea what apple sauce was like! I need to start baking with yogurt. These cookies look amazing! I need to start baking more with frozen yogurt. These cookies look amazing! No butter, plus whole wheat flour? Okay, I'm am digging these cookies. A happy mistake, indeed! Who needs butter anyway??? A moment on your lips, right! Thanks for sharing this happy accident! Love this recipe! 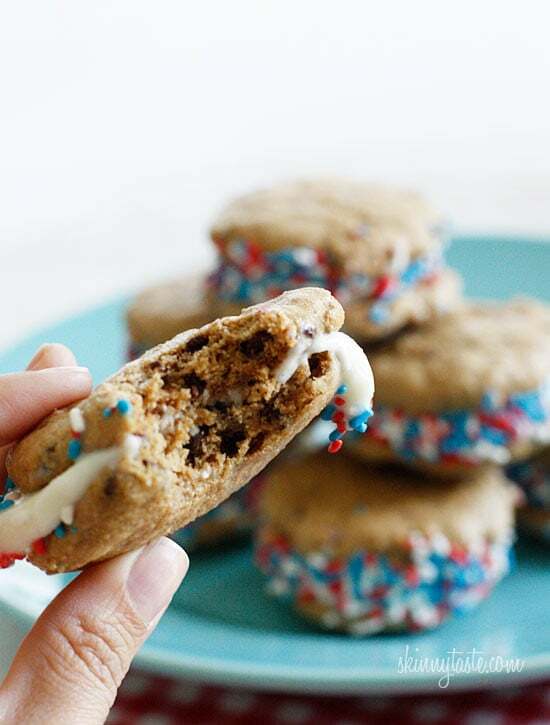 Definitely making these for fourth of July! Thanks Gina! I'm a little bit confused.. the original cookie recipes says 2 cookies for 4 (old) WW points, yet this recipe, with two cookies, frozen yogurt and sprinkles, is still 4 (old) points. I understand that the butter was eliminated from the original recipe, and the sugar was reduced from 1/2 cup to 1/3 cup, but does that really make up the extra points of the frozen yogurt and sprinkles? Do these cookies have the same texture as the ones with butter? Kudos to your reader who told you about the recipe with no butter! She deserves a round of applause! Too bad she is too shy to share her name, I would have liked to visit her blog. She must be a wonderful person to share that with you! 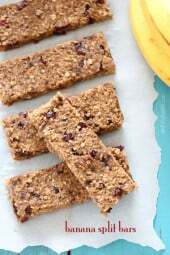 I have yet to try this recipe but looks good… I thought it may be good to instead of dropping individual cookies bake as a bar cookie and cut into squares then cut the frozen yogurt/banana 'ice cream' into matching squares. Thought assembly may be easier. I can't find whole wheat pastry flour. Where do you get yours? I can only find whole wheat regular flour. Would that make these cookies too tough? Whole wheat flour works fine. That's what I always use. Any chance you could share that recipe? It sounds delicious. My email is [email protected] if you could send it. You're right…that would be great between the cookies! Love all of your recipes! Any chance Agave would work in place of the sugars. I am insulin resistant, and always searching for sugar free healthy treats. Great recipe! Hmm, no butter in chocolate chip cookies? I love that!! I love when an error in baking turns out great! Awesome job of your reader! I know, so happy when people share stuff with me. I can't believe how many times I come to your website and you've created a skinny option to something I'm craving!!!!!! Do you know how many points just the cookies would be? I think I remember them being 3 for 2 cookies. 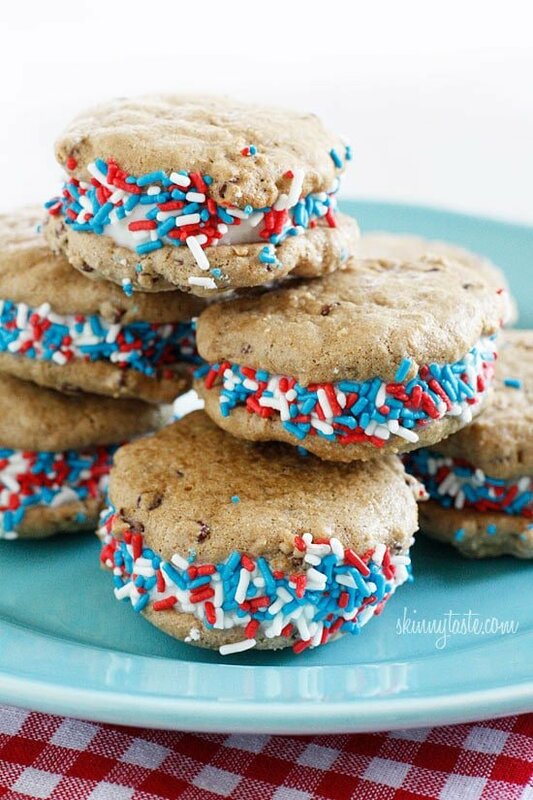 What a great dessert for the 4th! I love the sprinkles. So festive! You rock! 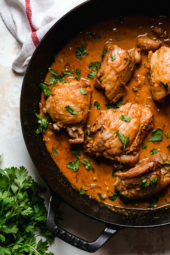 Another wonderful recipe that makes following WW a true lifestyle. I've been following your site and making your recipes since re-joining WW in Sept. Down 52 lbs. and 11 to GOAL! Couldn't do it without you! THANK YOU!! Wow, good for you, that is awesome! Ah, these are a great idea. My oldest DD will be turning 9 on July 4th. She will loves these. I have also made these cookies with 1/4 white and 1/4 cup brown sugar and they came out plenty sweet. My teenage boy loved them so they definitely passed the test!!! These sound so awesome! Yum! I made the cookies a few weeks ago & everyone loved them! They're on the menu to take on vacation next week! These ice cream cookie cakes are absolutely adorable! I must try these soon! The sprinkles definitely caught my attention. Can't wait to try these! I can't wait to try the cookie recipe, I loved the old one too! These sound great! Any thoughts on how long they would stay delicious tasting in the freezer? I think once frozen if you put them in baggies they will stay fresh longer. I made them yesterday, ate one today and it was good.